Judith’s book, Herbal Rituals is available as an e-book! St. Johnswort is the Queen of my summer. My heart never tires of the hunt for her golden blooms: she carries a very particular power that cannot be confined or defined by scientific tests alone. For who can measure a conversation between sun and flower, between stamens, petals, olfactory nerves and human fingertips? My small store of dried blossoms certainly seems magical: every winter, when I hold a mug of the hot, ruby colored brew between my palms and inhale the fragrant steam I am carried back to summer’s long days. For me, in some mysterious yet palpable way St. Johnswort stores the high sun of summer in her plant body, and the warm, uplifting nourishment that the sun brings can be retrieved by ingesting St. Johnswort buds and blossoms as a tea, anointing one’s skin with the blood-red oil, or sipping a garnet-tinged brandy of the flowers. Magic indeed. 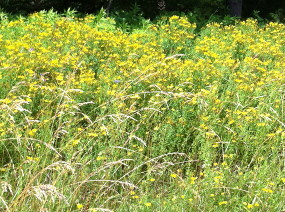 The scientific community has debated information about St. Johnswort’s reputation as a remedy for depression, isolating the plant’s chemicals and performing tests on the efficacy of particular “active” ingredients. I’ll leave the perusal of those reports to you*, though I’d welcome your company as I don a sunhat, grab my basket, glass jars, bottle of olive oil and vodka and spend a slow, lazy day in a field of the flowers, plucking buds and blossoms that have just been visited by the bees. If you’ve not yet had the fortunate experience of having a “cuppa”, I’m happy to share mine. When I savor the taste of dried St. Johnswort blossom tea on my tongue, steeped when the nights are oh-so-very-long, I have summer back. And as I swallow I know, that the sweet, astringent, pungent liquid will settle the tendrils of my nerves. Common though hypericum perforatum may be, the plant possesses a myriad of medicinal uses, with a particular affinity for relieving imbalances that have impacted the nervous system. Be it neuropathy or neuralgia, musculoskeletal pain localized to the spine, sciatica or “hysteria”, St. Johnswort can restore smooth flow to frayed, weakened, overloaded, inflamed, numbed nerves. I have applied oil alone and in combination with other herbal oils to prevent scarring from the vesicular lesions of Herpes Zoster, to heal contusions and to alleviate low back pain. The salve is effective on both sunburn and radiation induced burns (pairs well with calendula blossom here). I have seen the tincture effectively calm the inflammatory pain of sciatica, relieve the lingering pain of post-herpetic neuralgia (and shorten the course of herpes zoster), reduce diabetic neuropathy and stimulate the facial nerve affected by Bell’s Palsy. Finally, I have offered the tea when grief or troubles have made sleep elusive (nice with catnip and a touch of chamomile). And yes, I use it for depression—of a particular kind. If a client describes their sadness using images of darkness I call upon St. Johnswort: for the sun that lives in its flowers cracks through the curtain of gloom and allows in light. So, if you can’t join me today, sometime between mid- June and mid-august, take your basket out into the midday sun and find her, growing alone by the wayside, or in community in an open field. You may find yourself dazzled by the radiance of her blossoms, bright at midday, burnished gold as the sun dips lower in the sky. Settle down. Offer a song, a strand of your own hair, a bit of corn, a pinch of tobacco. When you pluck the blossoms, hold them in your palm and feel their paradoxical coolness. Inhale her signature scent as the sun warms the back of your neck and you enjoy the calming drone of the bees. Let the red oil that stains your fingertips and makes them tingle mark you as hers. Give St. Johnswort your time and she will give you her medicine. Yes, I take the jar and the oil out with me to the field and put the buds and blossoms in as I go, keeping them covered in oil. When the jar is filled, I top it off, and leave it on a shelf in the sun for 2 weeks, watching that beautiful color. When I decant it through cheesecloth, I keep the decanted oil in a dark-colored jar in a dark, cool, dry cabinet. Steep for 5-10 minutes, covered before drinking. 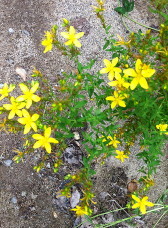 *Interestingly, when taken internally St. Johnswort can increase one’s sensitivity to the sun. And because the plant inhibits some chemicals in the liver and certain pharmaceuticals need that chemical in order to work in the human body, St. Johnwort can lower the effectiveness of some drugs, including oral contraceptives. Spring has been taking its time, showering New York City and the Catskills with lots of rain and cool temperatures. That’s how I came to be able to cook nettles and ramps together in a soup—made just in time to imbibe as a tonic for my unfortunate Memorial Day sore throat and cough. I’ve always known that Lady Nettle would be my desert-island-medicine, and Lord Ramp, wild allium that he is, begged to share the pot with faire Lady Nettle. His bulbs grew to quite an impressive size as the ramp season kept going and going and I wondered if that might be a kind of doctrine of signatures–to (ahem) stir the blood. For those of you who haven’t heard the term, the “doctrine of signatures” refers to the idea that the way a plant looks, the habitat in which it grows, or even the sound of the plant as it sways in the wind can give humans a clue as to the use of the plant. In this case, it was the very large bulbs that put me in mind of—, well, I think you get the idea. So – I went with a friend to my secret spot in the hills, to where the succulent dark green leaves of clumps and patches of ramps glinted in the sun; they seemed to be chanting now,now,now, along with the peepers, who were broadcasting their readiness from 6pm till 7 am, so that I had to move my tent far away from their overwhelming chant. I wondered if the scent of ramp peppering the air played a part in the endurance of their song. Nettles must be the source of the idea that sometimes good medicine stings before it gives up its nourishing gifts. Nettle has been with me now for a quarter century of my life, and I owe much of my health to this plant’s blood building qualities. When I get stung, I find myself chuckling– nettle describes who I am growing into—strong, wild, with stingers and lots of nourishment to offer, flowers not showy but strewing lots of seeds come late summer. I was picking them with a new friend recently, barehanded. The nettles were mixed in with yellow dock in her garden and by the chicken coop. My companion and I decided to do a scientific trial regarding the old adage “ nettle in dock out”. So she poulticed where she had been stung, and I did not. The buzzing sensation left behind by the sting disappeared moments after my fellow gatherer applied the poultice. On the other hand, I had little swellings on the side of my thumb joint where I had been stung, that lasted all day. Indeed, the sensation increased as the day went on, and did not subside until the following day, when my joints returned to their usual size. Ramps put up a brief burgundy stem, not unlike that of a plantain leaf, topped by one, two or three or sometimes even four broad, lance-shaped leaves that are succulent and seem mild at the first bite. Moments after that first, sweet taste, comes the raw heat; it’s onion-y nature can bring a red color to the face. My body feels an instantaneous strength, as if I have had an adrenaline surge. In soup they impart a definite viscous texture, as well as that signature pungency somewhere between a garlic and an onion. A ramp is definitely, most uniquely–itself. Don’t forget about Lord Ramp when ambling through the forest come summer. It puts up the most beautiful white flower, and when I’m backpacking, I always pick some to add to my dinner. In fall, I scatter some of the seeds into whatever I’m making as well. Lady Nettle of course, is called to other uses once the idea time to flower cross her green mind. Then her leaves have too much oxalic acid to be tasty (except as survival food). At that point, she is like an adolescent, slamming the door behind herself, shouting “Leave me ALONE!! !” And she means it. So, dear nettle-lovers, please leave her leaves alone once those flowers begin cascading down her stalks—but don’t worry, if you forget, she will remind you herself. In a medium size pot, bring water to a boil. Plunge in the nettle leaves, cover and cook for 5 minutes. Drain the nettles, placing a pot or large bowl under the strainer to catch the liquid. I usually drink some of the liquid and give the rest to my plants once it has cooled off. You can also use more than 2 handfuls of leaves, and more than two dozen ramps, of course! Separate the ramp leaves from the bulbs. Chop the ramp bulbs, and put aside the chopped leaves aside for later. Wash and chop the potatoes into mid-sized chunks. If adding carrots, cut the carrots into discs. Heat the olive oil, adding the sliced ramp bulbs. Stir over medium heat, adding a little nettle broth so they don’t burn. Add potatoes, water to cover, a bay leaf, and bring to a boil. Cook until potatoes are soft. With a ladle, put some of the potato chunks aside into a separate bowl. Feed the cooked potatoes, ramp bulbs and carrots into the blender with some of the broth, and puree. Place back into a pot. At the last round, add the cooked nettles and some buttermilk. 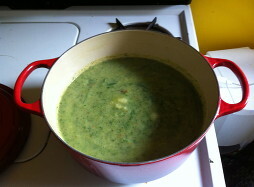 This last bit will be beautifully green, and add color to the soup. Begin to rewarm the soup, adding the chopped ramp leaves and chunks of potato, until the ramp leaves are cooked, about 5 minutes. Season to taste. Enjoy this brilliant green magic. Along with other herbal allies (Sage,Usnea,Echinacea in throat spray) the warmth and nourishment of the soup soothed my sore throat and cleared my lungs in a single day.